Other English name: Dutch Clover. White Clover is a perennial which in its natural state grows in patches. The stems are creeping and root at the joints. A single plant has thus the faculty of spreading over a wide area. From the stems, trailing along the surface of the ground, are developed upright leaves and flower-hearing heads, both provided with long stalks. In daytime and under normal conditions the three leaflets of which each leaf consists spread on the same level, giving the plant its well-known deep green shade. Toward evening, however, the plants take on quite a different look. The three-cleft leaves seem to have disappeared and to be replaced by small leaves of a bluish grey colour. When the sun begins to set, the two lateral leaflets move down toward the leaf stalk, at the same time turning so as to stand finally face to face. The central leaflet leans over, turning its bluish grey lower side upward so as to cover the two lateral leaflets. When the lateral leaflets are face to face and the central leaflet turned over their edge, the leaf is said to be asleep. Similar movements may be observed in any of the common species of clover and in a great number of other plants. They are especially conspicuous in the Shamrock. White Clover is fertilized by insects which carry pollen from one flower to another. Seeds will not develop unless the flowers are fertilized by pollen from another plant. The blossoms are rich in honey, and as this can be reached by the ordinary honey bee, White Clover is of great importance to beekeepers. When ripe the pods are oblong and contain three to five seeds. White Clover is indigenous to all Europe, southwestern Asia, Siberia and northern Africa. It is also claimed to be native to Canada and the United States, but this is doubtful. The locations where it occurs naturally in Canada are those in Which it may have escaped from cultivation; and the fact that all undoubtedly native species of Trifolium are found only in British Columbia and that these form a group widely different from the European ones indicates that White Clover is not indigenous to this country but was introduced by the early settlers. White Clover was first cultivated in Holland-hence the name Dutch Clover. It is at present grown in all European countries and practically all over North America. It occurs naturally in meadows and pastures, along roads and rivers, in valleys and on mountains. It will grow on a great variety of soils, from sand and gravel to rich loam and clay. It does best on moist, well-drained loams which contain lime and humus. It will not succeed if the soil is too stiff or wet. White Clover is especially adapted to a rather moist and medium warm climate. When other conditions are favourable, it will endure severe cold without injury. It is also able to stand a long spell of drought, provided the subsoil retains some moisture. It is true that most of the roots are rather superficial and that the growth is therefore affected by dry weather; but the main taproot penetrates to a considerable depth, and the plants will survive with sufficient moisture in the subsoil. 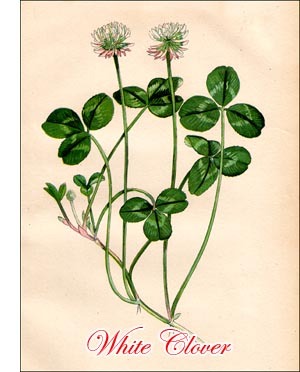 In Canada White Clover succeeds best in the Maritime Provinces, in the Great Lakes region and on the Pacific slope. It is not Well adapted to the Prairie Provinces. When once established, it covers the ground rapidly. The creeping stems branch freely, develop numerous roots and readily form large patches. The heads produce many seeds which fall to the ground and keep their vitality a long time. A few seeds dropped on the ground are thus able within a few years to make surprisingly large patches. This easy propagation accounts for much White Clover in places where it has not been planted and explains why it has been considered indigenous to Canada. Development is slow in dry weather but growth starts quickly when rain falls. If germinating early in spring, the plants generally blossom in the fall of the same year. The second and following years they produce an abundance of heads, which, if the plants are kept back by grazing, continue to appear during practically the entire season. On account of its low growth, White Clover cannot be used to any extent as a hay plant. Its chief value is for pasture, either alone or as bottom grass in mixtures. It is remarkably well suited for the latter purpose. It covers the ground quickly, providing a pasture of high nutritive value, relished by all kinds of stock. It stands tramping well and close grazing, instead of being harmful, stimulates it to a stronger growth. If the moisture is sufficient, it gives good pasture from spring to late summer. On account of being perennial, it is especially suited for permanent pastures and lawns. Six to eight pounds of seed will cover an acre.